This celebratory offer includes FREE DELIVERY to Mainland UK and Ireland. Orders must be placed by Monday for delivery that week. Orders will be put up fresh Wednesday morning and dispatched at lunch time with a DPD courier. If you give an email and a contact number DPD will let you know what time your delivery will arrive. Delivery to Northern Ireland and Ireland takes one day and will be with you on Thursday. Delivery to the UK takes two days and will be with you on Friday. All goods are perfectly fresh for 48hours when put into our special sealed boxes. The special gel ice packs keep the temperature perfect and can be re-used as an ice pack when you open the delivery.All products are fresh and must be used on the day of opening the box or Frozen for use at a later date. Do not open the box until you are home and able to store the products away securely in the fridge or freezer. 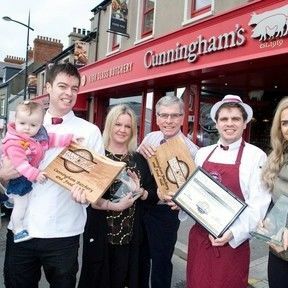 Three generations of the Cunningham family outside the recently expanded premises of Cunningham Butchers in Kilkeel. Donna Cunningham, her husband James Cunningham Jnr and their daughter Charlotte are pictured with Bernadette and James Cunningham Snr, their son Christopher and daughter Nicole. Missing from the photo is Rachael Cunningham. 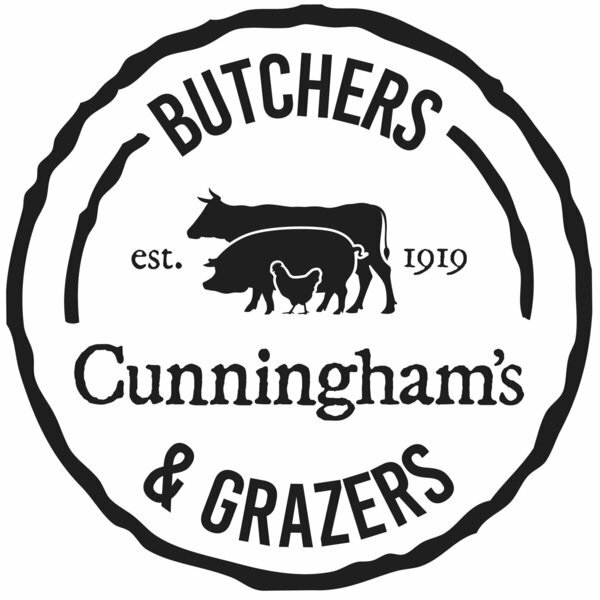 The family run firm was recently crowned the UK’s ‘Butcher Shop of the Year’ and ‘Best Retailer for Northern Ireland’ at the 2017 Farm Shop & Deli Awards.